I guess turning Abusive Sergeant into two lackies is appealing. Or activating a Scarab Egg. Those actually seem like things you'd want to do...not that imp stuff. Can it add 2 of a kind Lackeys ? Card text sounds like the battlecry would be optional. But I guess not. So far killing your own minions for a bonus effect never worked (only Power Overwhelming was used). At least this time you get other minions, so maybe. But I doubt it. This is a perfect zoo card. It replaces itself and potentially gives you more than you lost. 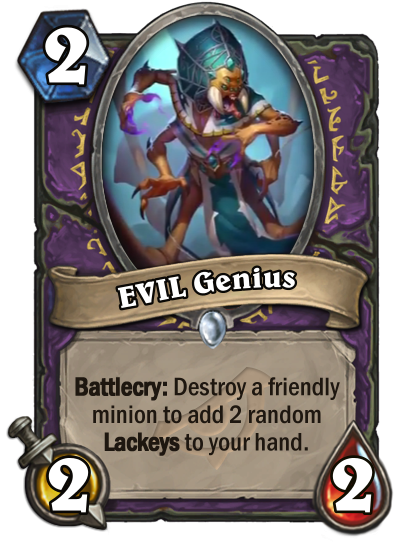 This also works in a deathrattle style deck and because its only 2 mana can fit into most turns. WoW, this is actually interesting. Support for Egg Zoo. I think you can play this as a 2/2 on 2 but why would you? You're gonna want those lackeys or you won't play this. Turn 2 is rarely desperate enough to just tempo this. Ok card, could be good in certain decks. Is there any good 1-drop with deathrattle? Problem is the only minion this is worth on to use atm is Scarab Egg. You don't want to use it on 1/1, its just not worth it. So we need more "Egg" cards or it's just a bad card. Maybe not in this rotation, but definitly a very good card in zoo type decks. You don't usually want to play a card like this on curve. You want to save it for the really good deathrattles like Voodoo Doll. Gonna be in all the new zoo decks. Rating this better than the priest one. Can always do something like - Kobold Librarian or EVIL cable rat into this and then Rafaam the extra lackeys you don't use into legendaries later. Acutally Mecharoo with this as a follow up is insanely strong. Zoo is not dead. 2 for 1, great deal!